This article describes the process for setting up financing options. I'm sure that each and everyone of you out there has encountered customers that don't have the money needed to make their critical fixes. With that in mind, I'm betting that some, if not most, of you offer financing plans to your customers. This article is going to detail how to integrate your financing options into Profit Rhino, and how to set up new financing options. You can setup multiple financing options within your account but only one rate will show. Whichever rate will produce the lowest monthly payment will be the financing option that shows. The first thing you'll need to do is log onto your Profit Rhino account and head over to the settings tab. Then, click on the tax/finance section and you should be met by the following screen. So just as a disclaimer, you'll already need a financing portal set up through another service. All this will allow you to do is integrate that financing option into your Profit Rhino so they can be used in tandem. That being said, lets go through all the information presented on the image. First, in order to make sure everything we're doing actually matters, enable the Finance option by clicking the drop down highlighted above. Now, with that done, click the blue [Add Institution] button. Doing so will bring up the following prompt. [Name] allows you to name your financing plan. [Code] isn't currently being used, but it's intended purpose to help keep better track of all the different financing plans you have, both in the web and in the mobile builds. [Phone] isn't really being used either. It allows you to enter the phone number of whatever financing institution/portal. This is just so you have the contact information to give to your customers/keep track of it for your techs. [Type] will allow you to choose from two different financing plans/types. "Fixed Period" is a "loan type" option where you set a certain %interest rate, and a set amount of time that it must be paid off. "Payment Factor" is more of a "credit card type" where you set a certain interest rate, give them unlimited time to pay it off, and set certain minimum payment thresholds. Whichever one you'd like to choose is up to you. [Website] will set up a link that will be used when you click on the financing option in the mobile build. 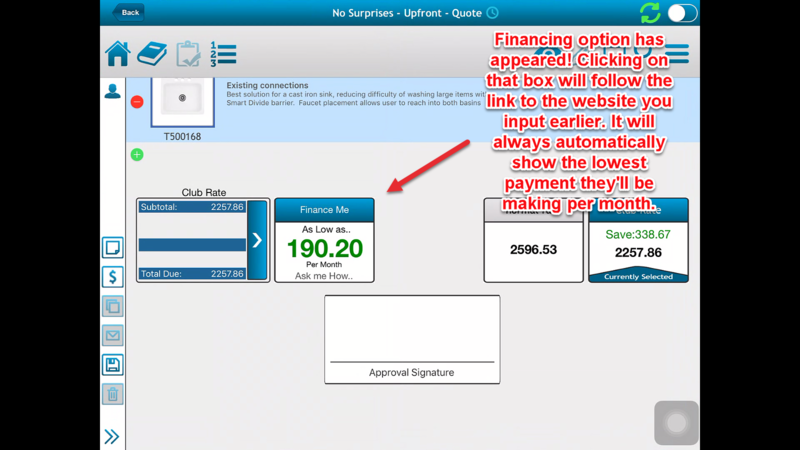 That way, if your customer wants to finance, you can set it all up right there with the click of a button. [Enabled] simply allows you to determine whether or not you want this particular financing option to be active at creation. Make note of what each term described in the image above means, and then click Add to move on to the next step. In doing so, you'll be brought to the following screen. A few differences you'll notice is the new PaymentFactor column, and the MinPayment column. What those basically equate to is a way of determining your customers minimum monthly payment. The PaymentFactor is a %, like 10%, that is required to be paid each month. The MinPayment is a dollar amount that must be paid each month. If that seems a little redundant, it's because it is for the most part. Usually your customers will simply pay the PaymentFactor amount every month. However, if your PaymentFactor is ever lower than your MinPayment amount, they'll need to pay that instead. This just makes sure you're getting a reasonable amount each month and makes sure your customer finishes paying it off when the % amount gets really low. To put that into numbers. if my financing plan is for 100$s that I owe you, and you set a payment factor of 10% with a minimum payment of 5 dollars then I'll be paying 10 dollars for the first month. For the second month, not including interest, I'll owe you 90 dollars. Therefor, my payment factor will be 9 dollars instead of 10. So I'll owe you 81 dollars after I make that payment. Then my next payment will be 8.10 dollars and etc etc. That is, until my payment gets below 5$. Then it will automatically become 5& every month until the total balance is paid off. With all that being said, click the Add button and move on to the next screen to enter your parameters. Simple hit save and you'll be all set. If you want to institute multiple ranges for financing, you can do that as well. For instance if you want to finance anything between 100-300 dollars, but you also want to finance anything between 500-800 dollars as well do the aforementioned steps two different times. For the min and max value, input those numbers for each instance. What I recommend doing is setting a minimum thresh hold for financing, say like 1000 dollars, and then input that as your minimum and set 999999 as your maximum. That way, anything over 1000 dollars can be financed without additional hassle. There you go, now you'll be able to offer your customers affordable financing plans with a simple button click. Good luck.